MASHED UP: The inside of the Cyril E. King International Airport after Hurricane Irma hit Sept. 6. CHARLOTTE AMALIE — Two months after Hurricane Irma, there’s a FEMA blue tarp covering the roof of the Cyril E. King International Airport — and airlines say that that is just not good enough. The Board of Directors and members of the St. Thomas-St. John Chamber of Commerce have voiced tempered, but anxious concerns about a perceived “lack of progress” in terms of repairs at the St. Thomas Airport after back-to-back hurricanes slammed the facility in September. 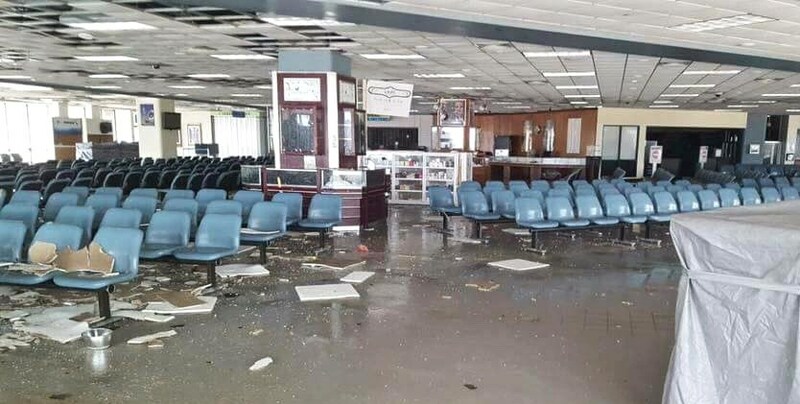 According to reports from the airlines and associated companies operating out of the St. Thomas airport, much still needs to be done to reopen the airport at full capacity. Only two gates are currently available at Cyril E. King International Airport. What is most needed to prioritized according to airlines are: roof repairs, fixing the air conditioning system and mold removal from walls and other surfaces, they said.